The 33rd World Amateur Go Championship will be held in Guangzhou, China, May 11-17, 2012. It is the first time that this event will take place in South China. Guangzhou, also known as Canton, is the capital city of Guangdong Province. It is enjoying great economic prosperity, flourishing development, cultural diversity and dynamic modernization. With a history of more than 2800 years, Guangzhou is forging its way ahead between its cultural heritage and fashionable skyscrapers. 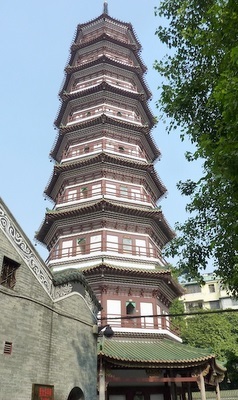 It offers tourists and visitors a feast of sights with unique charm, including the Flowery Pagoda, the Pearl River, the Baiyun Mountain, and the Temple of Six Banyan Trees. In 2010, when Guangzhou hosted the 16th Asian Games, the whole city improved itself comprehensively and impressed guests from all over the world with its ebullience and hospitality. Guangzhou Chess Institute has been chosen as the venue of the 33rd WAGC. 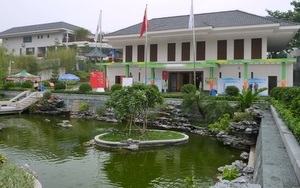 Located in scenic surroundings near the Baiyun Mountain, Guangzhou Chess Institute was rated “the most culturally attractive venue of the Asian Games”. Listening to the ripple of the stream, looking around at the traditional Lingnan houses, you may think you are in a famous garden. The simple and natural design of the playing hall speaks of calmness and harmony to the players and audience. The field of 55 players will range in age from 13 to 67 and in official rank from 8 kyu to 8 dan. Nearly half will be newcomers to the WAGC, and ten will still be in their teens. One teenager to watch will be 16-year-old Qiao Zhijian who has been cutting a wide swath through the Chinese tournament scene, winning the Evening News Cup to earn the right to represent China at the WAGC and then defeating the legendary Nie Weiping in the annual Evening News pro-amateur match. Three others will be Hong Kong’s 14-year-old Chan Chi-Hin, who took 15th place in the WAGC last year and then worked up to a 9-dan rating on the Kiseido Go Server, Chinese Taipei’s 7-dan Chen Cheng-Hsun, the youngest in the field, and the Czechia’s Lukas Podpera, who won the U20 division of the recent European Youth Go Championship. These four will be battling for top spots with formidable opponents from Japan, the two Koreas, Southeast Asia, Eastern and Western Europe, the Americas, Africa, the Middle East, India, and Oceania. Not all of the action will take place on the go board. Player registration at the Baiyun Hotel on May 11 will be followed by a series of meetings on May 12: a China-Japan-Korea Go Association Summit Meeting, an IGF Directors’ Meeting, an orientation meeting for the players, the annual IGF General Meeting, and in the evening an opening ceremony and reception. The tournament itself will take place in eight rounds from May 13-16, with a closing ceremony on the evening of May 16. On May 17 there will be time for sightseeing and other activities, including a night cruise on the Pearl River.